Citizens and businesses in Yamhill County want to reduce waste in a big way, and recycling is a crucial part of the solution. Together, we can divert waste from the landfill and save energy by recycling everything from used materials and storage containers to electronics and scrap metal. Please note charges apply for some materials. 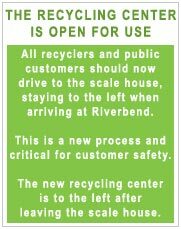 For more information and inspiration about recycling, visit Yamhill County Solid Waste or Think Green. Small batteries – with ends taped - Also accepted at Lowe’s, Home Depot and the Household Hazardous Waste Collection Events hosted by Yamhill County. Tires do not go in the landfill! For any tire put into the landfill, there is an additional recovery fee of $14.00. No particleboard, drywall, or cement fiber board. Call Riverbend at 503-472-8788 or email riverbend@wmnorthwest.com.